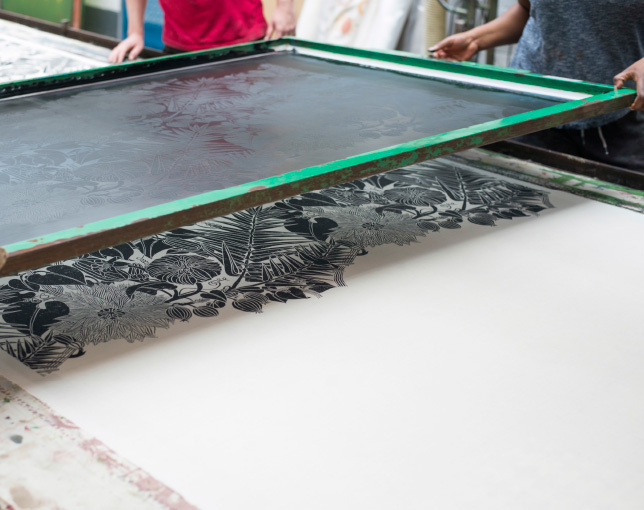 For handmade wallpaper designs, a 100-year old hand-operated offset litho press is used. Bought from a warehouse in Brixton in the 1970s, and weighing in excess of 1 ton, it was originally made for printing single design samples. 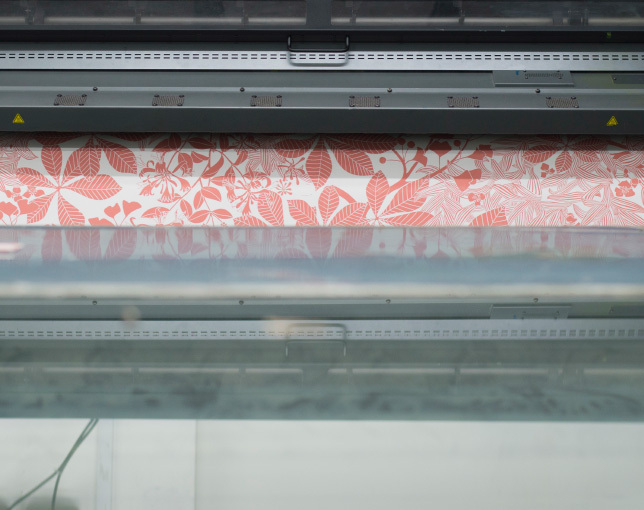 Adapted for Marthe, to hold and feed 1km rolls of paper, it is used to print the handmade wallpaper range, in 10m rolls of cartridge paper. The linocut artwork is created right-reading, and will appear this way on the finished wallpaper, thanks to the process of offset lithography. Colours are mixed by hand, to match required samples for clients, with oil-based relief printing ink by manufacturer T.N. Lawrence. 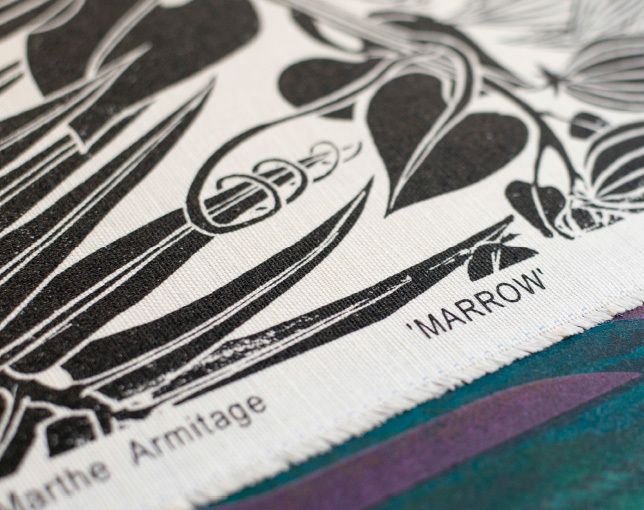 From rubine red and yellow ochre to rich ultramarine, the colours are selected to create the earthy, subtle shades that typify a Marthe Armitage print. There is no recipe, no precise formula, and no alternative to the accuracy and sensitivity of the human eye in this process. 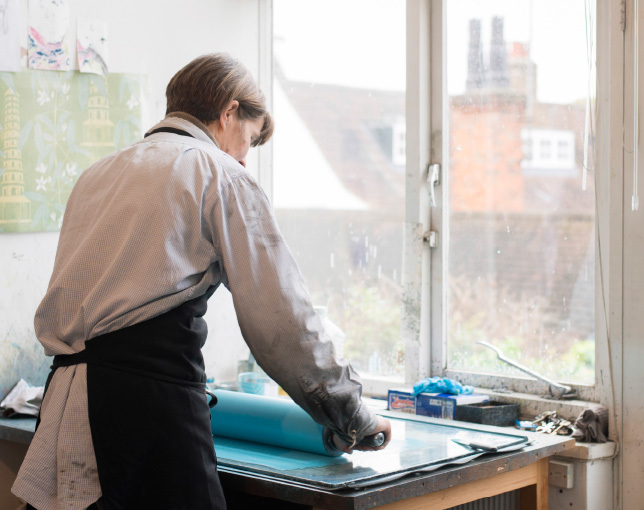 to pick up the ink from a large glass sheet, and is then rolled over the linocut, now affixed to the printing press on a metal backing sheet, its edge bent to form a lip, holding it straight and securely fastened in position. With the turning of a large handle, a silicone-coated drum on the printing press is rolled over the inked linocut on the machine, picking up the image in reverse. Once past the lino, the roller deposits the image onto the wallpaper, so that it is now right-reading, to match the original artwork. Consistency of speed and pressure in turning the handle are critical, and great care is taken to mark the starting position for each image on the paper, or to make minor adjustments to the machine’s pressure, in order to create an even diffusion of the ink and accurate tonality in each image. As the roller recedes, the print is suddenly revealed. There is an intrinsic contrast between the rumble of the heavy, century-old press and the delicacy of the image silently emerging, like a butterfly from its chrysalis. The moment is nothing short of magical. 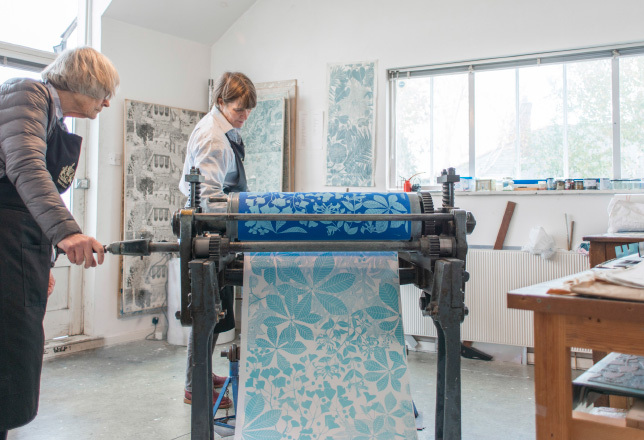 Marthe Armitage Prints Limited work with textile and wallpaper print specialists, Ivo Prints, based in London’s Southall, and run by Michael Haas. 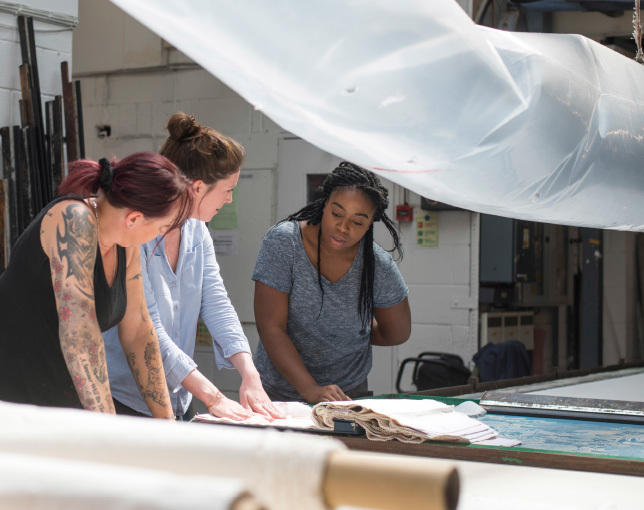 The company has over 50 years’ experience in fine printing, which has included creating fabrics for fashion designers such as Vivienne Westwood, Ossie Clark, Biba and Zandra Rhodes. 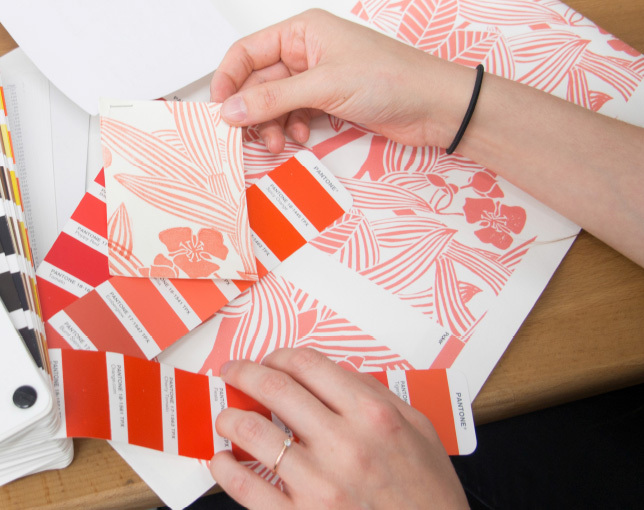 The company focus in textile printing today is very much on bespoke products for use in interior design, with a team of textile designers and printers and highly skilled colour-matching specialists. 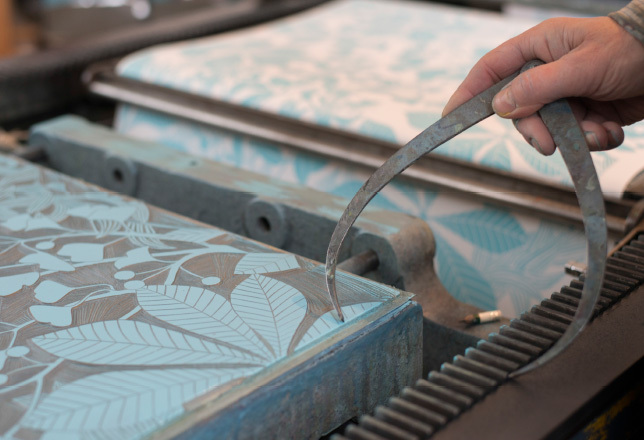 The technique used to create the Marthe Armitage range of furnishing fabrics to coordinate with the wallpapers is flatbed printing, a silk screen technique whereby each colour has a separate screen, and colours are printed one at a time to achieve the finished design. This gives each fabric a hand-finished look, including the charm of small imperfections which are characteristic of the method. Marthe’s designs are printed exclusively on high quality linens, with pigment ink in colours carefully selected to match the palette of the wallpapers. 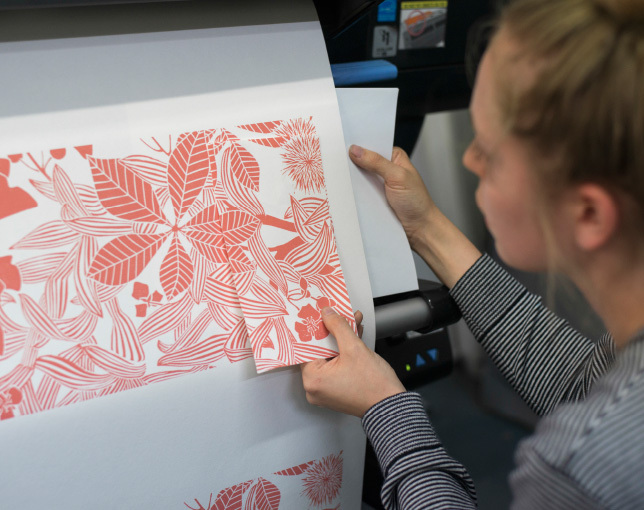 In addition to working with Ivo Prints to create coordinating screen printed fabric, Marthe Armitage Prints Limited also works with this specialist company to produce an exclusive range of digitally printed wallpaper. 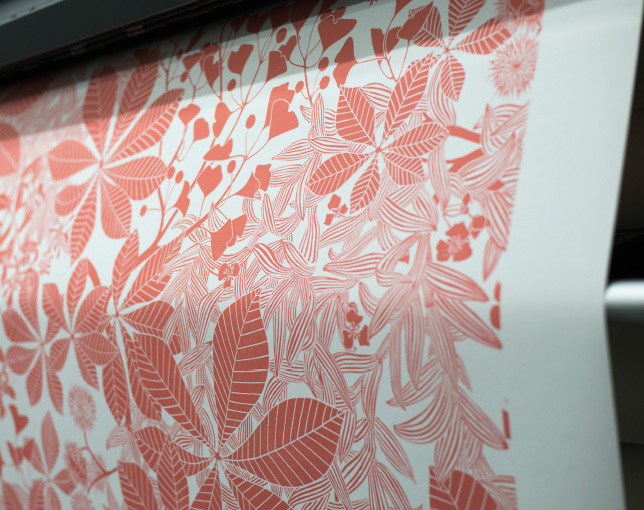 Marthe’s linocut designs are digitally printed by Ivo Prints in wide format with a print width of up to 140cm, on contract grade non-woven paper, ready for use on pre-pasted walls. Great attention is paid to colour-matching, and to the precise reproduction of the linocut image itself, using highly sensitive scanning and colour separation techniques. 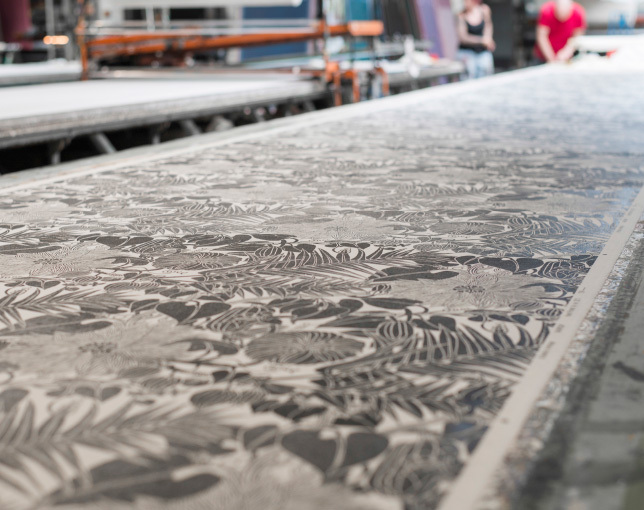 The use of digital technology, in which Ivo Prints excel, ensures this degree of accurate representation of Marthe’s artwork, in a wallpaper which can be produced at greater speed than is possible by hand-operated production, and in a wider width. This is designed to offer more rapid coverage of large areas, for clients for whom this may be a requirement. It has also opened up the opportunity for Marthe to create new and highly detailed designs to be scanned and printed directly from her artwork, without the use of lino blocks.